Published on June 9, 2010 in General T&T, International, People's Partnership, Politics and UNC. 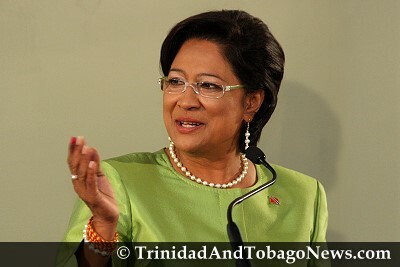 16 Comments Tags: CARICOM, Kamla Persad-Bissessar, Politics, Prime Minister, T&T Govt. Prime Minister Kamla Persad-Bissessar has blanked today’s Caricom meeting with United States Secretary of State, Hillary Clinton, in Barbados because she felt it would be an insult to the people who elected her to travel without taking the parliamentary oath. Persad-Bissessar gave this explanation yesterday in response to criticism from Opposition Leader Dr Keith Rowley who said the Prime Minister’s failure to attend today’s meeting was ‘a dereliction of duty’. ‘I was of the view that we have not been sworn into the Parliament and it is the people who elected us to represent them there. It would be offensive to the people to travel to represent them without taking the oath in the Parliament,’ said Persad-Bissessar in a brief interview with the Express yesterday by phone. Makes no sense. Sorry, just take responsibility for this misstep and apologize and move on. You insulting the people intelligence here. Foreign Ministers were invited to the meeting. The Prime Minister had no right going there, so what should she appologise for???? DUH. Besides Manning met Hillary & Obama and less than a year later look what happen to him… I say to the P.M. avoid those people at all cost. The people of Trinidad and Tobago have spoken on May 24 and there is no mistake of who is the Prime Minister, an oath has been taken and there is no doubt in the population’s mind as to who the PM is. It is more than OK for Kamla attend. This is not a critism folks …………… she need not be so cautious! It seems to me that a good opportunity to show the new face of Trinidad and Tobago is missed by her not going. I hope it is not really because, with Jack away in SA, there are people to be feared if named acting prime minister, even for half a day! They might stage an internal coup. After the NAR won, there was similar fear.A prime Minister should not be trapped by her own cabinet, in a place of discomfort. I hope Mrs. Clinton would not see this as a snub.I am sure the other PM’s of member states would have warmly welcomed our new Prime Minister. Wherever Mrs. Clinton is, the world’s media is; good opportunity lost in the interest of safety? Maybe.Only time will tell. Unfortunately Mr. Rowley is taking a page out of Mr.Panday’s playbook. As leader of the Opposition, it seems that he believes that his primary function is to recklessly oppose, with loud lamentations at every turn. One would think that a lesson was learned from Panday’s demise. His frequent provocative and disingenuous remarks since assuming the position as Leader of the Opposition will force the nation to question his capability. He began his tenure by following the lead of his former leader, the failed Manning, ungraciously neglecting to offer congratulations to the new PM and coalition government. He follows up by mischievously questioning the dual roles of Jack Warner, knowing full well that there are numerous precedents of officials holding multiple roles in T&T and elsewhere. He then tries to plant the phony proposition that the new PM is snubbing Hilary Clinton by not attending the Caricom conference in Barbados. Obviously he did not learn any lessons from Manning’s useless globe trotting which once elevated to the request for a private jet. He could not specify precisely how the nation would be hampered by the absence of the PM at this conference. Kamla offered a more than reasonable explanation for not attending and emphasized the fact that the country was being represented during this transition period. But Mr. Rowley’s worst faux pas to date is his recycling and appointing of some of the failed old faces of the PNM and branding them as new. The PNM’s first mistake at renewal was the appointment of tried and tainted Rowley as the leader of the Opposition. His desire to reclaim the glory days of the PNM is based on a misunderstanding of very nature of the country itself and the changes which have occurred over the years. His acceleration out of the starting blocks so far has been disappointing. No wonder why some members of the PNM San Fernando constituency meeting walked out during his speech recently. Now the plot thickens as cousin T-Man is getting his jockstrap in a twist as to what our extremely astute Opposition leader ,is doing right off the blocks, to ensure that lurking barbarians ,don’t overrun the ship of state, or run roughshod over our basic fundamental rights ,and blessed Constitution. Ain’t it laughable to see this neo tribal , sectorial apologist ,try to make a comparison with a man of integrity , and sound moral standing like Dr. Rowley , and the lifetime hate-monger , national divisive agent, and obvious criminal as characterized by the politically demised Basdeo Panday? Listen to me cousin T-Man , if this incompetent ,laptop fronting comedian , and nepotist ,was doing his politically mandated job while serving as an Opposition leader, then Manning his drinking pal , would not have been allowed to develop the arrogance, and self opinionated mindset , that ensued over the years, so as to bring the country to the tenuous state it was relegated to , where citizens of all stripes, became so disgusted , that they were eventually prepared to ‘vote for a crapaud,’ over most of the many candidates that were put forward by his party. Now please do not tell me that you are indirectly calling your new PM a liar T-Man. The lady said she was not sworn in as PM , and so could not sit and drink coffee with Hillary in Barbados, so soon after here historic victory. You in contrast , is saying it’s because she wanted to save the country money . Now tell me T-Man how much miles you think it is from Sweet T&T to Calcutta, for as we speak’ our good lady has an invitation on her desk for a visit to her ancestral homeland India pretty soon.Do you think the Indians , are solely interested in finding out how many more Hindu Temples they can construct in Tobago , out side of the influence of Sat , so as to see if they can get him to burst a vain in his neck and die soon? Listen my friend , you have a big task ahead as chief paper shredder in the Sat Maharaj orchestrated ,Ministry of Multiculturalism , of the Kitchen Cabinet of Madam K. Your first order of business should be to attempt to piece the party’s manifesto together , and re read the section -for the boss when he comes back from his SA football jamboree -that speaks about a proposed new political culture, of socio economic change,that entailes high individual ethical standards ,honesty in leadership, as well as governmental ,and business transparency – all actions that if adhered to in the past ,would have prevented the 95 Basdeo Panday’s ghastly governmental stewardship, and embarrassing political fiascos that forced his party to remain so long in the political wilderness, but which was fortunately ended ,on May 24th when the electorate were finally convinced again , that the UNC party , as a result of prudent alliances with others, were then fit to be given a second chance on power. Just leave the Mason Hall kid alone, if dem crazy Panday lifetime party hacks could bite their lips, and deal with new leader Madame Kamla after the political hazing of her then boss Bas, then Sando East would do the right thing when the appropriate time comes. Many are more angry at themselves for not kidnapping Manning , his loyal wife, and two carefree kids , then set them adrift to Cuba, or Venezuela long before the election. They are free to let their steam out a ‘lil bit,’ but would come around in due course. The challenge moving forward , for your party is this T-Man, can they control the co PM uncle Jack Warner? I know that you failed miserably on history, but again , if you comedians think that Jack Warner, Errol Mc Cloud, Mayaro Mighty Gypsy, and Speaker Mark , is a reincarnation, of Selwyn Richardson, ANR Robinson, Ken Gordon, and Karl Hudson Phillip , then you are sadly mistaken. Doubt me? Then let the party Barracudas that are encircling Madam K ,push their luck ,as we love to say in our Central , San Juan , Grande ,and St. James rum shops. I wish you well my friends, and hey, remember- love country over tribe! It is unfortunate that Prime Minister Kamla Persad-Bissessar seems to have locked herself and the Government into an uncalled-for bind by taking the position that no minister will travel abroad on state business until the Parliament is convened next week Friday. Is this guy ‘Neal’ some sort of psycho on the loose? I could never understand what the hell he’s trying to say! Lots of words, very little meaning. What does “Hindu prince ,aka ‘Nehru reincarnation”, “praying to dem flags” and the mention of any race or religious perspective have anything to do with “kamla not attending Caricom talks”. Where is the correlation? Where does ministry of multiculturism and Sat Maharaj fall into this story? Race and religion is an easy target, that’s why many of you continue to use them to get your arguments across. It makes you feel good. I must say that’s being very weak though. You sound like someone with an inferiority complex issue man. Anyway, that out of the way, I think our PM should have gone to the Caricom meeting herself. It would have been a great opportunity to interact and introduce the new government to the other Caribbean leaders and Mrs Clinton. I wouldnt really have felt insulted, but I do understand at the same time that she’s trying to put everything in place before embarking on any foreign business and there will be many more opportunities to meet Mrs Clinton and Caricom during her tenure. I dont see this as any great loss to our country. Why should Kamla bend over backwards for the U.S. when there is not even acknowledgment of the new government on the U.S. embassy website. I think the snub was to Kamla from the Obama administration and she should not bother to beg Hillary for assistance with the rest of the Caribbean. Trinidad is an independent country after all and not part of a U.S. empire. Personally, I think she did the right thing. She is now the Prime Minister Elect, and as Our President Obama said before he was sworn in. Only President at a time.Once she is properly sworn in, then it would be an insult not to attend. Prime Minister Kamla Persad-Bissessar was not expected to attend the Caricom meeting in Barbados, which was attended by United States Secretary of State Hillary Clinton, Foreign Affairs Minister, Dr Suruj Rambachan said yesterday. Way to go. Kamla. That was a class act according to international protocol – we will find some excuse to ignore Neal the ranting ignoramus: he doesn’t count. Shame on Obama for not congratulating our Prime Minister – he ain’t goin’ to get no freeby on no more “conferences” from this new, constructive, professional cabinet (compared that with the cringeing idiots of the PNM regime – spreeing with our money like a bunch of drunks). The Rt. Honorable Prime Minister of Trinidad & Tobago, Ms. Kamla Persad Bissessar (Esq.) appreciates law, protocol, and simple human decency – on all counts, she was correct. Go Kamla. Shut up the rest. THE EDITOR: Hitherto Prime Minister Kamla Persad Bissessar has performed at her brilliant best. The PM has effectively, clearly and convincingly transmitted the ethical bases and the people-centred governance values and priority that will pilot and drive her new administration. This is a breath of fresh air. It has energized, renewed and lifted our flagging spirits. Effective 24 January Kamla has been on a roller-coaster. Was this the alleged weak leader? She has rescued and pulled back T&T from plunging down the edge of a fiscal, economic, social, moral and spiritual cliff. Psychologically speaking the flowers have started to bloom again. The hills are alive with the sound of music — with chutney and soca — with pulsating tassa and seductive pan — with the cosmic music of the spheres. God is a Trinbagonian. Kamlamania has restored our faith in Him. Calling Him is a local call once again. Kamla’s decision to insist that the taking of the requisite parliamentary oath on June 18 as a pre-condition to Ministers travelling abroad to undertake our international relations responsibilities is a powerful signal that her Administration will be rigidly adhering to and restoring the primacy of Parliament. Parliament is the seat of all power and political legitimacy. In the current post May 24 political environment the brave and independent foreign policy decision taken to forego participation in the Barbados meeting with Clinton is a decision to be commended — not condemned. The Obama Administration and Secretary of State Clinton will respect our return to adhering to the tenets of real parliamentary democracy especially when the previous Administration did every thing permissible to diminish the status of Parliament. Even a PNM Woodford Square Meeting took precedence over Parliament and disturbed the proceedings of Parliament. But when peaceful marchers undertook a legitimate picket of Parliament during the rushed property tax debate they were subjected to police brutality and their leader arrested. This is not the first time that T&T opted out of a diplomatic Barbados meeting when a high ranking US representative summoned us there. Our policy must be one of constructive and selective engagement with the outside world based on respect for the will and the overriding interests of the people who are the real government of T&T.